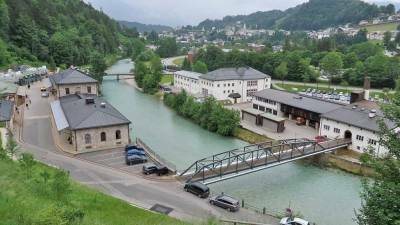 Getting to our Berchtesgaden Visit from Passau turned out to be an interesting experience. We had two options for trains and with some communication difficulties we ended up choosing the Bayern ticket as the Austrian ticket was slightly more expensive. 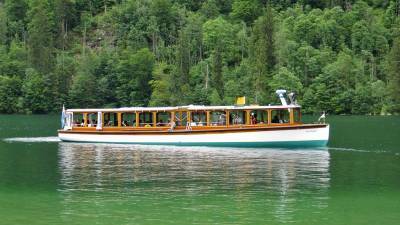 It wasn’t until we were underway that we clearly understood why. 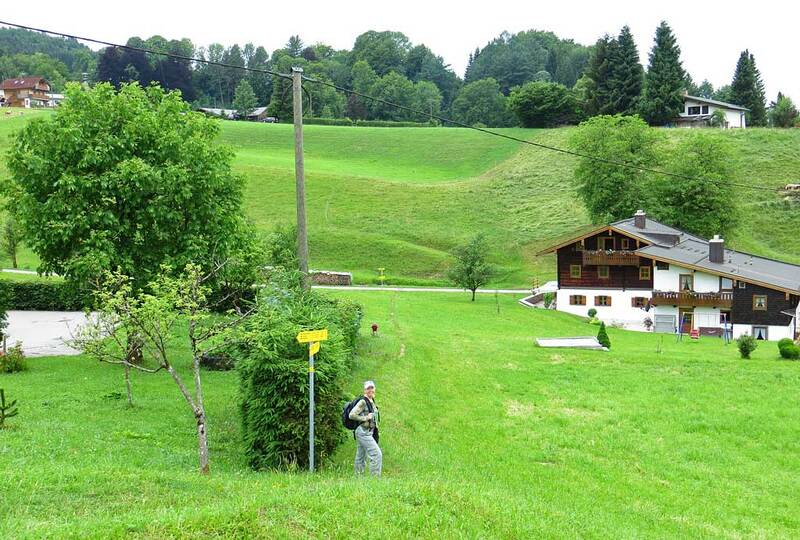 The border between Germany and Austria is unusual in this area as it runs north / south instead of east / west. 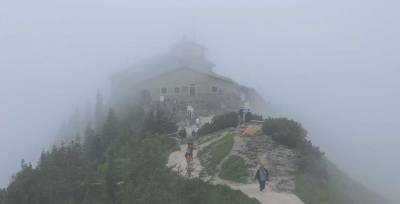 Either route led to Salzburg, but the Bayern ticket travelled through rural Germany and took much longer. 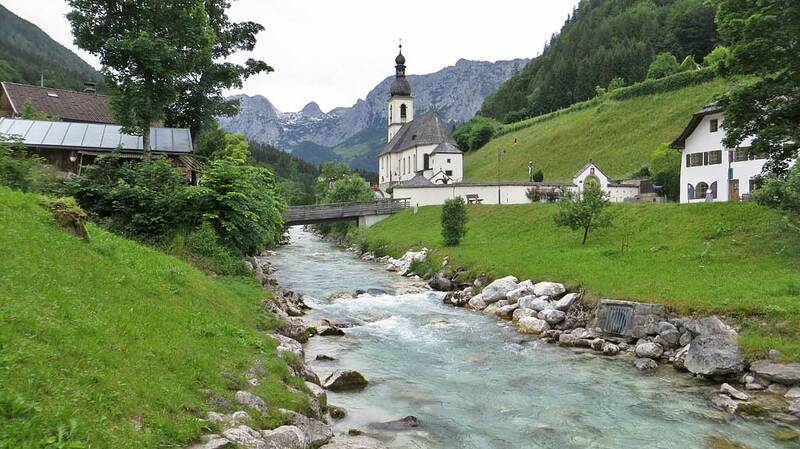 It was very picturesque traveling through the small villages, though. We set up at the H+ Hotel Salzburg and this was a perfect choice. 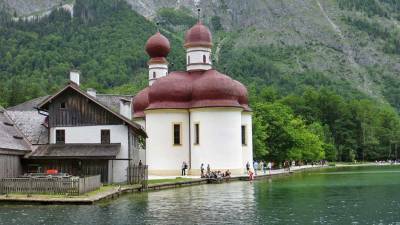 It’s located on the square facing the Salzburg train station and the central bus terminal. The hotel isquiet, comfortable and reasonably priced. We easily caught a bus to the airport and picked up a rental car to head to Berchtesgaden. The technology in the diesel Volkwagen was amazing, but fairly hard to figure out, especially with my poor skills in German language. 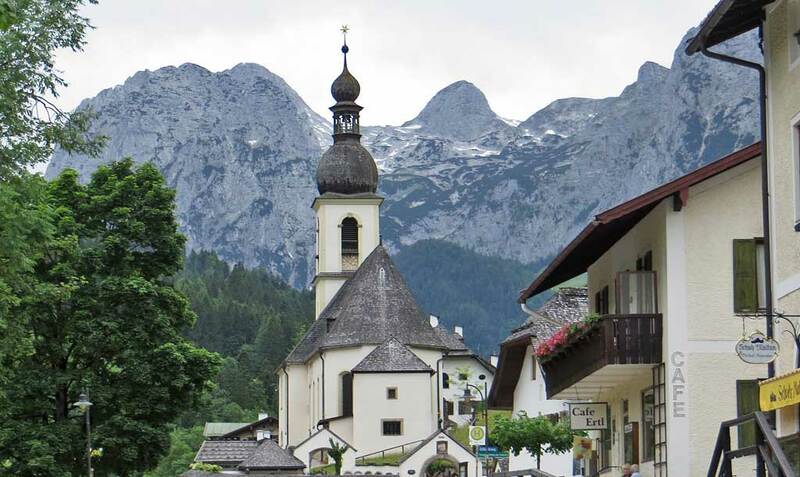 The GPS was essential to get us to Berchtesgaden because even though it’s only a half hour away, it’s a maze of streets, thoroughfares and the autobahn to get there. The forecast was for rain and it was beginning to threaten. 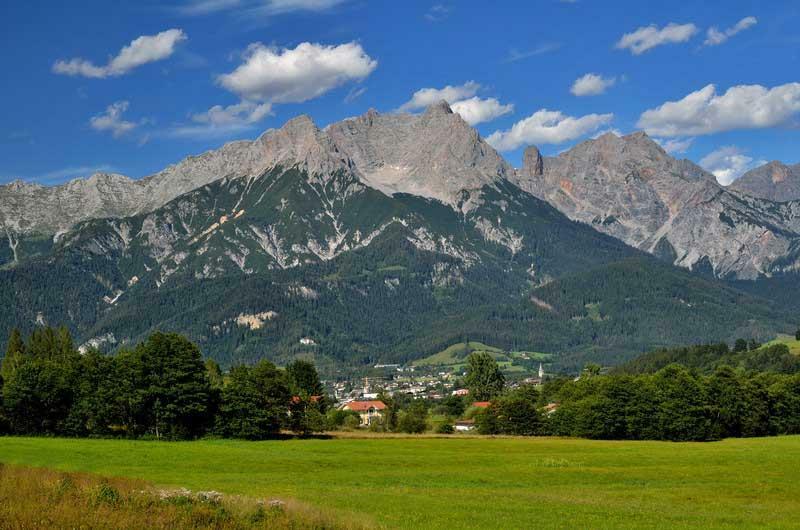 Once you get near Berchtesgaden, the valley and mountain views are fabulous. 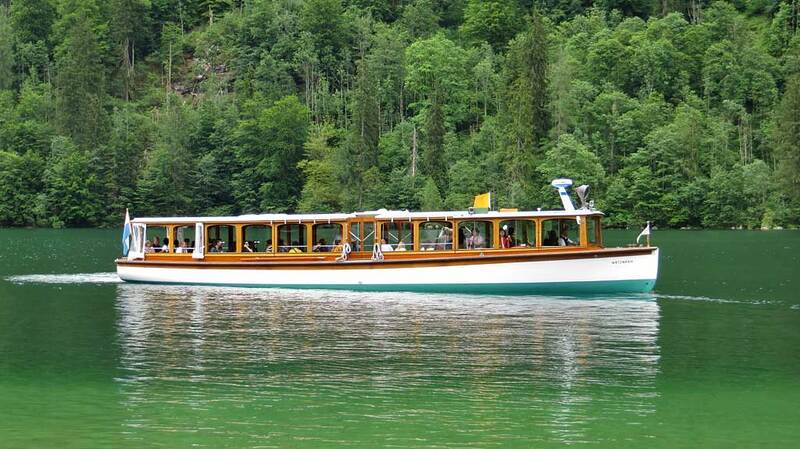 We headed 10 minutes south of town to the Konigssee and took the electric boat to St Bartholomew’s. We didn’t enjoy this much. The weather was cloudy. Tourists were backed up in a long line for boarding the boat. En route, the pilot paused at a cliff edge to play a trumpet and produce an echo on the steep mountain. Afterward his collected tips from all the passengers for his brief and musically challenged efforts. I was not impressed with the tacky ploy. We spent more time in the return line than we did visiting St Bartholomew’s. Next we headed to Ramsau, which is about 15 minutes west of Berchtesgaden. 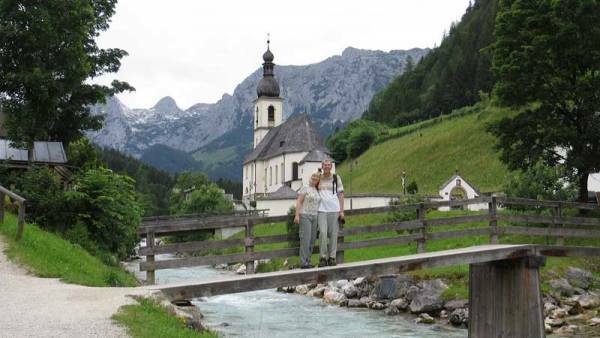 The most popular thing to do in Ramsau is to photograph the Parish Church of St Sebastian by the Ramsauer Creek. I’ve owned a jig-saw puzzle of the church for many decades, so it was thrilling to finally see the site in person. It looked exactly like the puzzle. 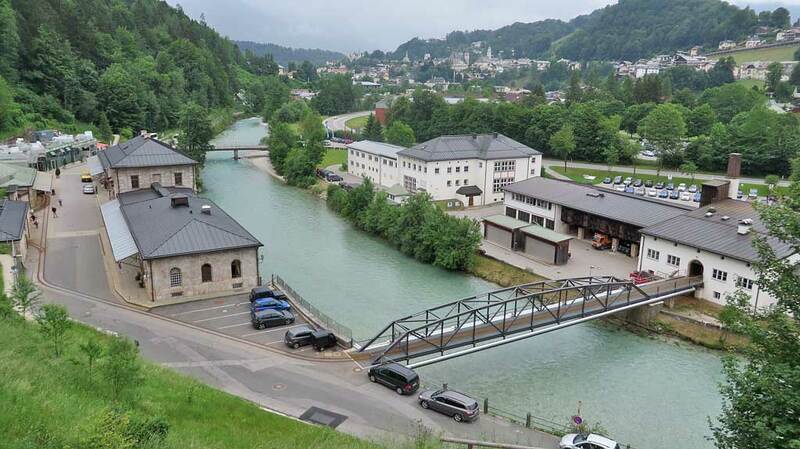 We ate by the river at Wirtshaus Waldquelle. This was traditional German fare. You walk into a large home, past guests wearing lederhosen, and pick your own table. I tried pancake soup, which was an odd idea with an odd taste. The proportions of pork, schnitzel and spaetzle in the main courses were twice what we could eat. After dinner, we returned the rental and then took the bus back to the Ramada. In the morning, we took the bus to Berchtesgaden, which is a much easier and less expensive option than a rental car. The bus stop for the #840 was on the square at the hotel and day passes can be purchased in cash from the driver. In Berchtesgaden we transferred to the #838 and headed up the the Dokumentation Obersalzberg at the base of the Eagle’s Nest. The bus stops at the parking lot and it’s a short walk to the Dokumentation Station where the history of Hitler’s love affair with the area and his war planning is documented. The ticket station for the Eagle’s Nest is located at the eastern edge of the parking lot. We took the specialty bus up the 24% grade, but we were soon lost in the fog and clouds. At the top, heavy clouds obscured any view whatsoever. When you arrive, you must obtain a return ticket with a specific departure time. A short elevator ride then takes you to the building that Hitler enjoyed so much. 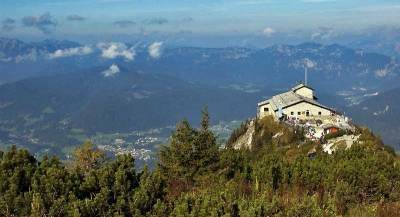 Hitler’s Eagle’s Nest is now only a restaurant, as the historical artifacts are all at the Dokumentation station. When we returned to the Dokumentation Obersalzberg on the way back, we noticed hiking trails and decided to walk for just under 2 hours back down to Berchtesgaden. 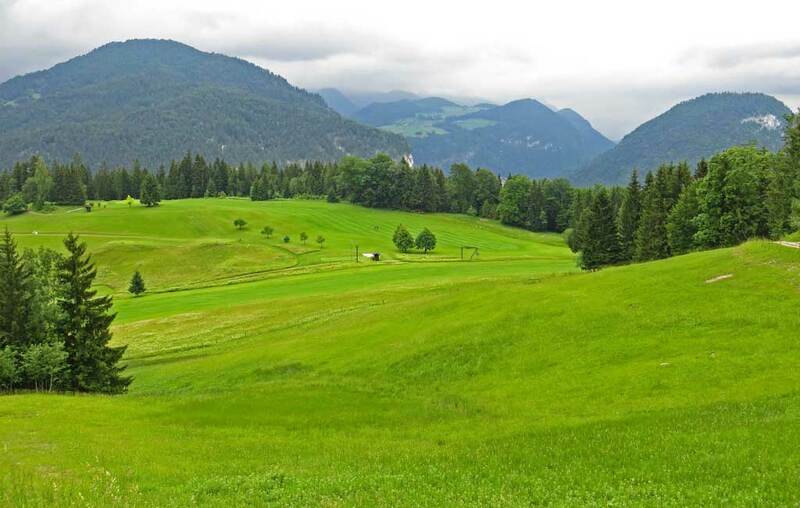 This was a beautiful trek through forest, alpine pastures and the river valley. In the last few minutes of the hike the rain started pouring down on us. The bus ride back to Salzburg ended a lovely day. The bus system from Salzburg to Berchtesgaden, the Konigsee, Ramsau and the Ealge’s Nest is a great way to visit this area of Bavaria. Next adventure Switzerland Train Trip.